« “Forgotten Hollywood”- Laurel & Hardy Weekend Comedy! Carl Rollyson is Professor of Journalism at Baruch College, The City University of New York. He reviews biographies regularly for the Wall Street Journal, the Minneapolis Star Tribune, and other newspapers and periodicals. The one intangible impression made by Rollyson is his love for the work of actor Dana Andrews. I’d like to think I helped motivate the reviewer to finish an uncompleted manuscript on the life and times of this mostly underrated actor. Of course, this is conjecture on my part. Hollywood Enigma: Dana Andrews is available in bookstores, on Amazon, and is being well-promoted on Turner Classic Movies. According to the cable promo, the new book talks about the dubious relationship the star had with Hollywood studios; his fall from grace into alcoholism; and his redemptive later career. There is little doubt Andrews had lots of talent. His work in Laura, The Ox-Bow Incident, and The Best Years of Our Lives proves as much. What’s also clear, executives had trouble casting the actor in important cinema. FYI… The George Bush Presidential Library Foundation and Museum is presenting Laura as part of their free monthly Classic Film Series at the Annenberg Presidential Conference Center on the campus of Texas A&M University on Thursday, September 13th. In conjunction with Sam Houston State University, Carl Rollyson will have a book sale and signing of his latest book following the screening. I’m thrilled to promote my esteemed peer’s new work. 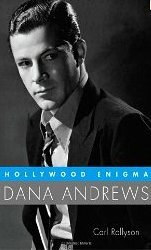 I intend to place it on my to-read list, since the enigmatic Dana Andrews is clearly part of Forgotten Hollywood lore… You should also consider adding the book to your literary collection! This entry was posted on Friday, September 7th, 2012 at 12:40 am	and is filed under Blog by Manny Pacheco. You can follow any comments to this post through the RSS 2.0 feed. Responses are currently closed, but you can trackback from your own site.